And now I have a version of this. I use it as often as I can. Better for the environment and saves on the electric bill. We'd go up to the roof of our six-storey NYC apartment building where the clotheslines were to hang our freshly laundered clothes. But you had to bring your own (wooden!) clothes pins. Like GlenEllyn said, "clean sheets fresh off the line." I liked the smell, but of course we didn't have the pollution we have today. Mom never had a dryer until 1980! My job routinely as a kid was to hang the clothes on the line, even in the cold dead of winter! (Yeah, I know all about the stiff towels lol) She had a wringer washer too. My mom used her clothesline regularly even though she had a dryer - well, except in the middle of winter, although she tried it a couple of times. I remember the towels came off the line stiff as a board! We kids thought it was a hoot! I'd like to put in a clothesline - there's nothing better than sleeping on clean sheets fresh off the line. My next door neighbor had one of these. It always got in the way whenever my brother and I wanted to have a catch in our backyard. 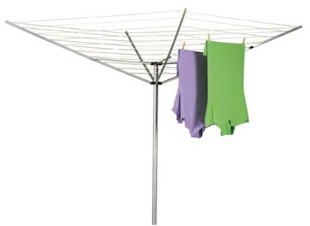 Though we have a dryer, we still use our outdoor solar/wind powered dryer as often as possible. My mom still has one of these in her back yard.